1.Prepare outdoor grill for direct grilling over medium heat. In small bowl, whisk together garlic, soy sauce and honey. Place chicken in large zip-top plastic bag; pour soy sauce mixture over chicken. Seal bag and refrigerate 15 minutes to marinate. 2.Meanwhile, in small nonstick skillet, toast sesame seeds over medium-low heat 3 minutes or until golden brown, stirring frequently; transfer to plate. 3.Remove chicken from marinade; discard marinade. Place chicken on hot grill rack and cook 10 to 12 minutes or until chicken loses its pink color throughout and internal temperature reaches 165°, turning once halfway through cooking. Transfer chicken to plate; keep warm. 4.Meanwhile, in large nonstick skillet, heat oil over medium-high heat. Add ginger and cook 1 minute, stirring frequently. Add mushrooms and carrots and cook 4 minutes, stirring occasionally. Add spinach and cook, covered, 2 minutes. Stir in lemon juice. 5.To serve, evenly divide spinach mixture over each of 4 dinner plates. 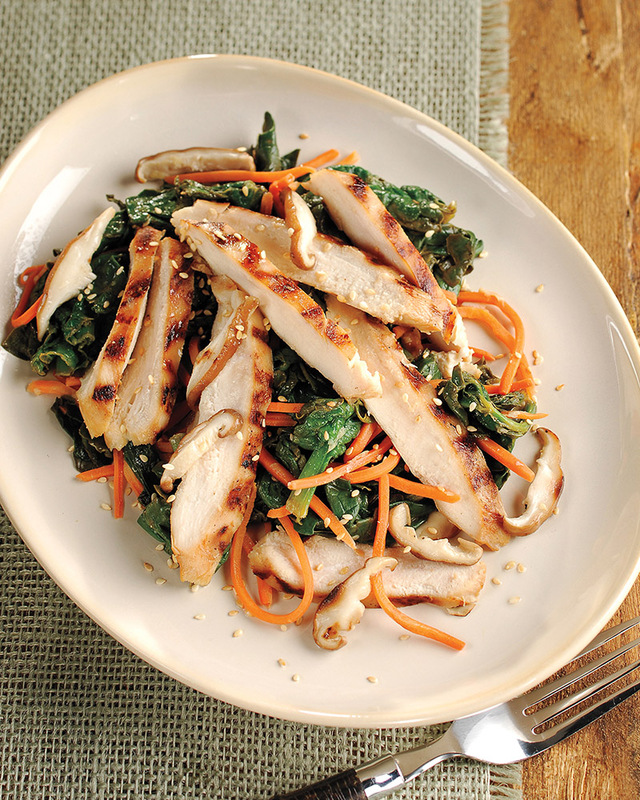 Slice chicken and place over spinach mixture; sprinkle with sesame seeds. > Follow these easy tips when using fresh ginger root. 1. Easily peel the ginger root skin using the edge of a spoon. 2. Store leftover peeled ginger root in the freezer. 3. Take it out of the freezer when you need it and simply grate – no need to thaw!